Pirate's Practically Perfect Pillowcases On the following pages are various quilts that I have made over the years. They are arranged in chronological order. 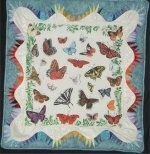 For each quilt, there will be a large photograph, smaller detailed photos and various links that will result in a another tab which will show details of the quilt or an informational web site. 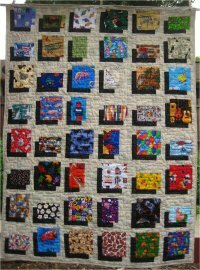 Most of my quilts are machine pieced and machine quilted. I'm not a great fan of doing hand-quilting myself. 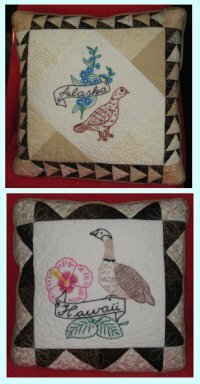 I have frolicked with 2 small hand-quilted cheater quilts, as well as one baby-sized throw that was all traditionally hand-quilted and decided that eventhough I absolutely adore and love hand-needlework of all sorts, hand-quilting is incredibly tedious and boring. I don't even entertain the thought anymore. 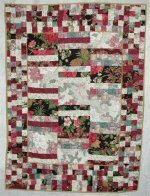 That being said, I have the utmost admiration and appreciation of quilts that are hand-quilted. I know how much time, energy, talent and perserverance is required to do a quality job. 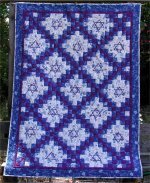 Those who hand-quilt are absolutely awe-inspiring. Addendum in 2004: a long-term UFO was pulled out the pile and was diligently worked on. 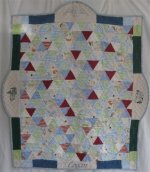 This was my very first hand-pieced and entirely *hand-quilted* sampler quilt. It's listed in the first section (1978/1979). 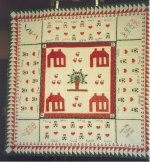 It was several years after I began making quilts that I became aware of how important putting a descriptive label on the back of the quilt was, noting such information as who made the quilt, who for, date(s) involved and any interesting tidbits. 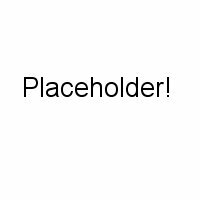 With that in mind, I created a label for myself using my "pirate" persona. 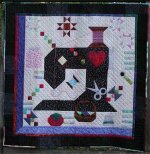 Since the creation of my pirate label, my quilts are now properly documented. 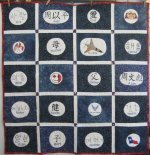 I do regret that my previous quilts don't have one of the labels. links are in chronological order, going from left to right, top to bottom. 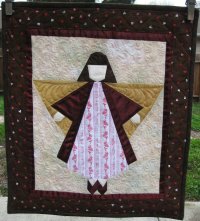 Under some very suspicious circumstances, I found myself being squeezed out of my sewing spaces, to the extent that towards the end of the 1990's, I was sharing my sewing area in a VERY small enclosed back porch with the laundry room, the pantry, my home-based word processing business. My supplies were scattered all over the house and storage sheds. It was incredibly frustrating. Fortunately, (in one sense), my younger girls had begun middle school and I no longer was sewing clothing for them. On the other hand, I simply didn't have the physical space necessary to sew anything, anyway! Did I mention it was incredibly frustrating? In retrospect, I think I was a very cranky Mommy for a number of years .. I never realized just how important being creative was to me until I wasn't able to do anything. By the end of 2000, I could see that I was really going to have a new sewing room the spring of 2001, but I couldn't wait. In a very small area in the living room (where a LOT of the stuff from the demolished back porch was being stored), I set up a temporary sewing area and made a quilt *for me* (what a concept!). September 2000 Halloween 2000 September 2000. 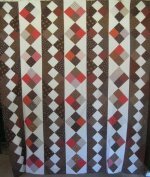 January 2001 Stars and Stripes Zig Zag January 2001 Red, Black, Cream Double Wedding Ring finally quilted in 2009. 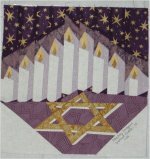 2001 produced 16 quilts, 1 memorial block and 1 quilt started that remains unfinished for a total of 18 quilty projects! 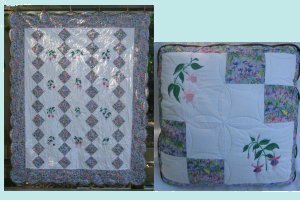 2003 produced 14 quilty projects: 1 block for a comfort quilt, 1 project on hiatus BUT ... 12 completed quilted items! Now, I feel compelled to add at this point that in November 2004, I bought myself a Janome 300e embroidery machine. I had been having waaaay too much fun with this new toy and doing embroidery projects. 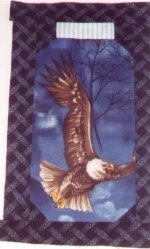 You can see those projects on the Machine Embroidery page. (or who knew a king-sized quilt would be THAT big?) 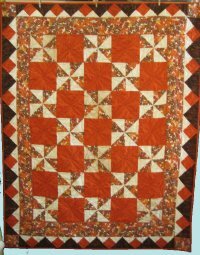 top completed but still unquilted. Winter 2006 A Machine-stitched Cathedral Window. 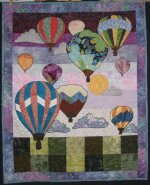 Let's see ... the "Together Quilt" is the only completely new & finished quilt this year; Chiclets is still an unquilted top and hence, technically speaking a UFO. Garden Twist was a UFO that was finally finished. 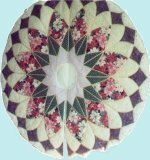 Other UFOs that were completed in 2006 but already had an listing in a different year are: (2000) Lone Star with Celtic applique, (2004) Early American Tinware and (2004) Deco Crystals-Shades of Tiffany. 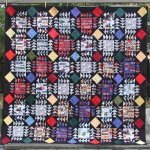 What DID happen to 2007's quilting? 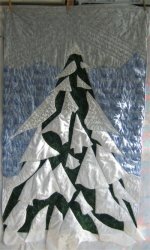 I was sure I hadn't done any quilting whatsoever, but in looking back through my computer files, I find that I actually DID do exactly 4 quilting projects in 2007, with one a continuing WIP. FINALLY! 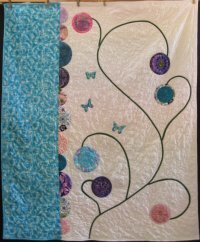 a hand-applique method that is practically fool-proof! No templates, no freezer paper, no glue! This method is AWESOME! August 2007 Toile Duvet cover Rene's high school graduation bed covering Fall-Winter 2007 AHH! Real Monsters! 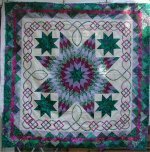 Top completed, but still unquilted. 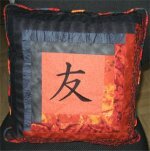 Applique! But 2007 is a big, ol' long stretch of time for a mere 4 projects. You probably think I was watching the soaps and eating bon-bons. HA! My ::ahem:: dear daughters have, once again, pressed me into service for sewing garments for them. 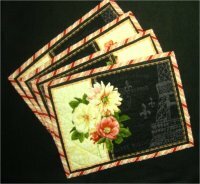 You'll need to go to my sewing page to see what was taking up the majority of my time in 2007.
and napkins and coasters! and reversible! non-embroidered, alternative layouts for Zundt Corners (original done in May 2005) September 2008 India via Inverness a souvenir from a weekend trip turned into a quilt. 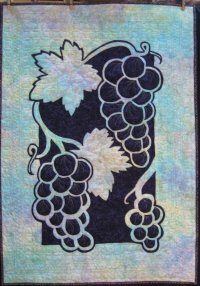 a hand-appliqued stained glass wall-hanging (well, it's gonna be). 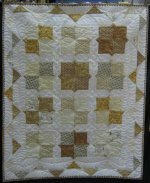 Top completed but still unquilted. 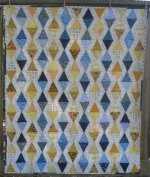 another top that waited very patiently in waiting for its turn in the sun to be quilted. 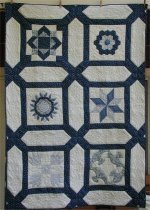 November 2008 Store demo/display quilt. 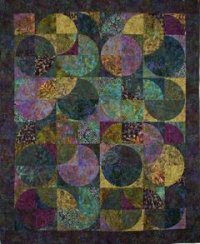 a curved seam top made in *2004* finally gets quilted in 2008. November 2008 I thought I had used up most of my flannel lefovers. I was wrong. 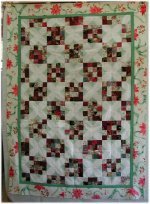 A quilt pattern of pinwheels and appliqued vines from McCall's Quilting, August 2008 issue, done in more leftover flannels. January 2009 Disappearing 9 Patch. Really. 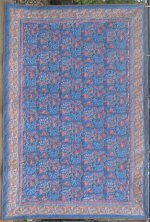 How ugly can a fabric be? January 2009 Kyoto - a color block quilt. 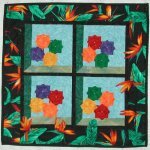 using squares leftover from the Disappearing 9 Patch. 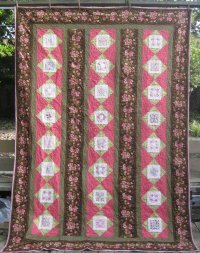 a ginormous pillow using the Kyoto layout, though not a companion to the quilt. 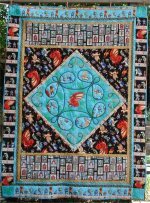 My memento quilt of the 2009 Arizona Quilting Retreat. 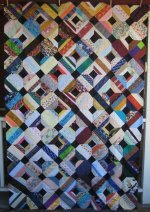 teaser photo - top completed but still unquilted. 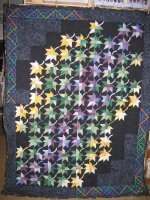 March 2009 Wonderful 1-Fabric quilt. 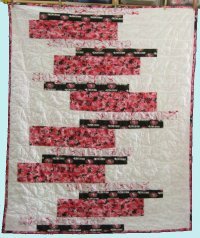 fuschia flower fabric and machine embroidered fuschias make a very belated thank-you gift for my cousin. 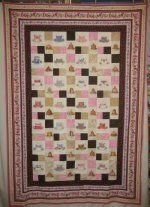 June 2009 Memory quilt for baby Logan Lee July 2009 Forever Project: the Diggin's quilt. The webpage is LONGER than usual, if you can believe that! It might take you forever to read it. 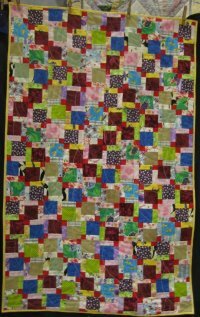 anytime during 2010 Charity quilts. 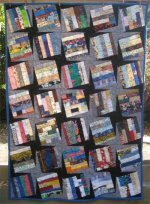 I support the Bay Area Crisis Nursery, a local charity, by donating kid-sized quilts. anytime 2010 Amazing! 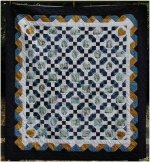 Other people commissioned me to quilt their quilts! I'm so jazzed! 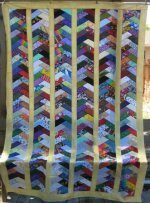 January 2010 A rainbow quilt made from a kit of bundled hand-dyed fabrics. 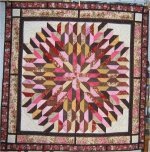 This is the first quilt I used feathers as an all-over design and I am simply *thrilled* with the way it turned out. 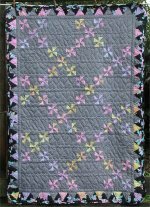 :-) January 2010 Nabi Garden, a companion quilt made of leftover blocks and fabrics from Lisa's high school graduation quilt (which was done in 11/09). 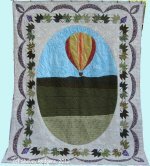 This top was quilted in March 2010. 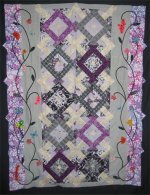 March 2010 Madeline, a layout available from Electric Quilt. 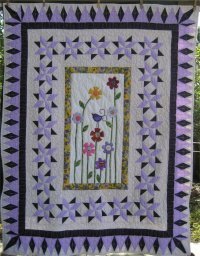 My version is rendered using a floral stripe with mitered corners and machine embroidery in the centers of the Economy Block. 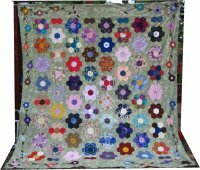 April 2010 Flower Power, a 9-patch pizazz variation, was a comfort quilt for a cousin undergoing cancer treatment. 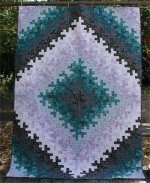 April 2010 Royal Mendhi Crystals is a free pattern that I executed using a turquoise charm pack. 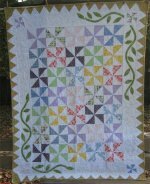 May 2010 An "antique" block is replicated in order to use up a whole bunch of bonus half-square triangles. June 2010 Cage liners for our Veterinarian I needed to doodle and practice some longarm quilting but didn't need the doodle cloths afterwards. 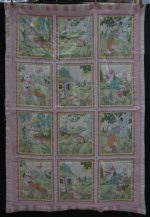 With sturdy fabric as a backing, some thick loft batting and muslin, these doodle cloths made excellent cage liners for the animals to lie on. 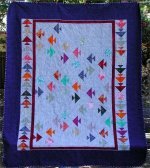 June 2010 Equilateral Triangles. Using my newest, most favorite ruler set :-), I've been creating oodles of blocks. Now I need to actually use them! July 2010 French Braid. 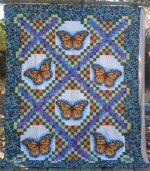 I finally made a quilt for myself from this fantastic pattern. 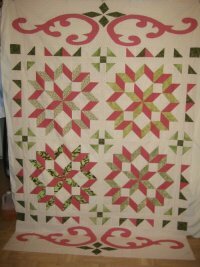 Finally quilted in March 2012. July 2010 Friendship Braid. 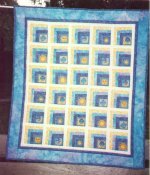 This was another comfort quilt for another cousin undergoing cancer treatment. August 2010 4-Patch and Straight Furrows. 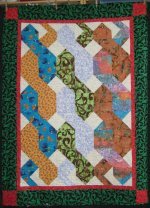 This is an adaptation of a free design, which I made to use up MORE of the hand-pieced 4-patches (which originally came from the 7/2009 Diggin's Quilt). August 2010 Teacups and Desserts. 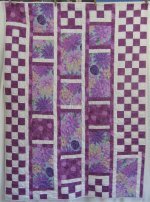 Using 2 wonderful focus fabrics and blenders, this *one* block pattern is very easy to construct. August 2010 Dress Me Up. 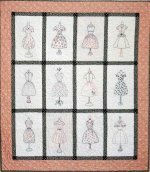 This pattern features 12 blocks of hand-embroidered 1950's dresses on mannequins. August 2010 Underground Railroad. 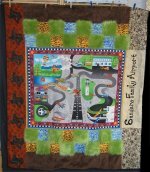 Inspired by "The Runaway Quilt", a series of books authored by Jennifer Chiaverini, this quilt uses up even MORE of the hand-pieced 4-patches originally used in the 7/2009 Diggin's quilt. 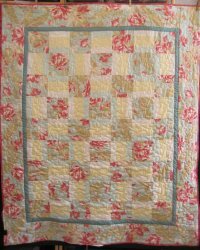 Quilted in February 2011. 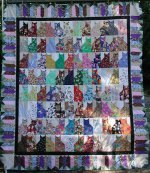 September 2010 Annika's Cat quilt. Annika is Mr. Pirate's grand-niece, a whole 2 years old. 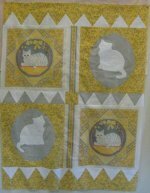 This quilt was created using a pre-printed cat panel and trapunto'd cat appliques. September 2010 Woven Ribbon Trees. 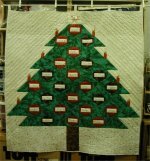 A variation of the traditional Rail Fence uses triangle blocks (the same ones as in the June 2010 Equilateral Triangle quilt) as trees. November 2010 Gone With The Wind. 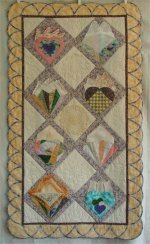 A variation of the free pattern to commemorate the 75th anniversary of the film, "Gone With The Wind". November 2010 Carpenter's Wheel. 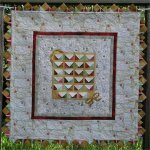 I used up the bonus half-square triangle blocks from "Gone With The Wind" to make this quilt. November 2010 Lumiere de Noel. 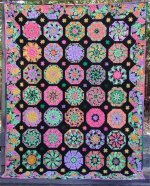 A free pattern from Moda to showcase their new fabric line. I made my version from my stash. It retains the look-and-feel of the original design without breaking my bank! 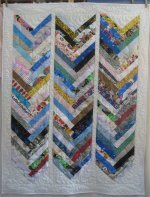 Quilts finished in 2010: charity (16), personal (16). Total finished; 32. 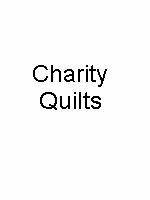 Quilts still needing quilting: charity (2), personal (8). 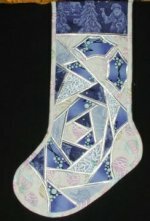 January 2011 A set of throw pillws made from leftover diamond shapes and shapes from Sizzix die cut. These are sill a WIP. 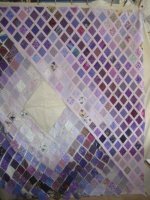 January 2011 Inspired by Jane Austen, this WIP purple quilt is going to take a VERY LONG TIME to complete. March 2011 Apple Core. 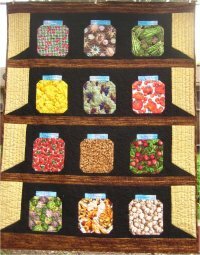 I had made some Economy Blocks for a friend's quilt and as a thank-you, she sent me 25 die cut apple core pieces. 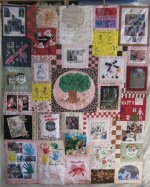 March 2011 Josephine's Memory Quilt. 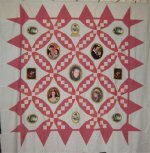 My Dad's lady friend turned 85 and her daughters asked me to make a memory quilt for her. 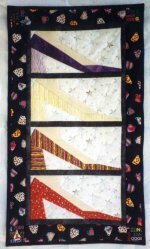 March 2011 The zipper quilt. Mr. Pirate has commented that my quilts are "defective" because they don't have a zipper. 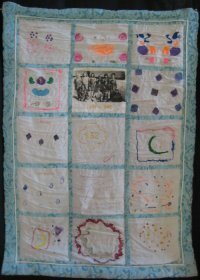 This quilt corrects that oversight. :-) April 2011 Jelly Parfait, using up more of the leftover Jane Austen diamonds. 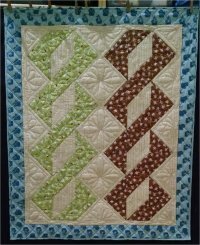 Finally quilted in August 2012! 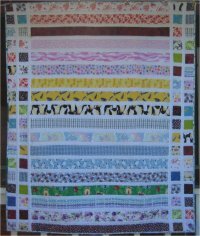 April 2011 Jelly Roll from Oz. Our middle daughter spent a semester at an Australian university and came back with a jelly roll. 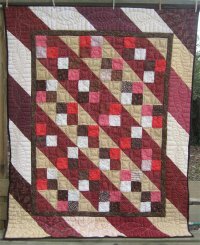 This still needs to be quilted. 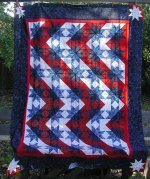 May 2011 Lone Star made with hand-dyes. 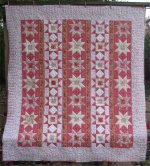 A fantabulous bundle of hand-dyed fat quarters was used to make this Lone Star. 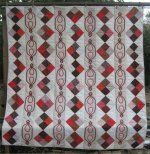 The maroon is NOT part of the quilt .. that's the design wall! The setting triangles & squares will be black New York Beauty style blocks. Very much still a WIP. 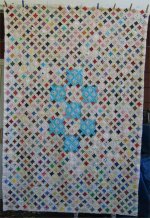 May 2011 Madeline's baby quilt. 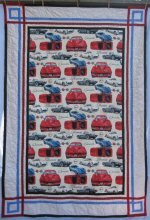 The newest member of the Rodgers' family received a baby quilt made from a pre-printed panel and a custom-fit dogtooth border. October 2011 Chicken Placemats. And a center mat! And coasters! Oh my. 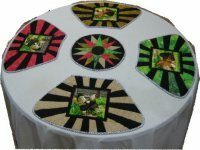 :-) Printed squares of colorful chickens are the focus of these placemats for a round table. October 2011 Sedona's String of Pots. A memento of a vacation trip to Arizona. 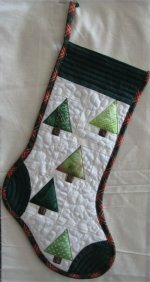 November 2011 A Christmas stocking for Forrest. A new member of our family gets his own Christmas stocking. December 2011 Smitten with Neutrals. An unexpected Last Hoorah project of 2011. Oh My Stars!. 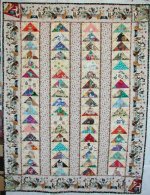 A blogger presented this as an online Quilt Along. 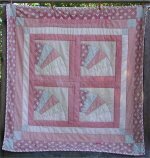 I was able to make a bonus baby quilt too. February 2012 Robots. 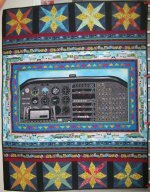 The 4-patches were received as a UFO and I finished them into this quilt. 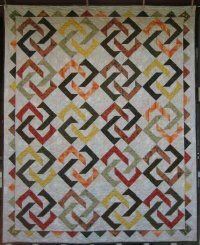 February 2012 Kolbe-Trinity fundraiser quilt. 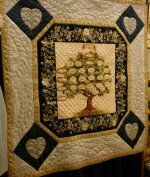 I designed, pieced and quilted this queen-sized quilt for a fundraiser for the Kolbe Academy and Trinity Prep schools in Napa, CA. March 2012 Golden Angel. 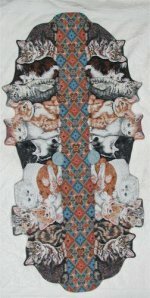 This wall-hanging was designed around a Michael Miller printed panel. 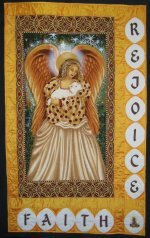 The letters are machine embroidered and the small angel in the bottom corner is a machine embroidered free-standing lace design that I used as an applique. March 2012 a single Christmas placemat. I had these cute little Christmasy blocks leftover from something, so I made a single, solitary placemat around them. March 2012 Slithery Snakes. One of our nieces had a baby (a boy this time!). 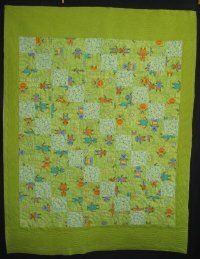 A baby quilt with slithery snakes was appropriate! April 2012 Ninja Throwing Stars. 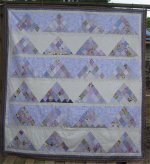 A blogger's "Festival of Half-Square Triangles" provided the inspiration to use up a messload of HST leftover from a previous project. Gimme Diamonds. 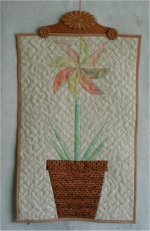 Based on a commercial pattern, my version is only slightly different. July 2012 Peace. 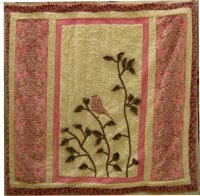 This is a needleturn applique wall-hanging. It is a duplicate of the one I made in 2007, but this one is for *me*! July 2012 Friendship Braid. 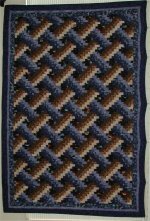 Another Friendship Braid using half-hexagons. 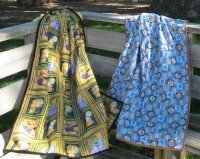 October 2012 "Whole Cloth" blankets for two brothers. 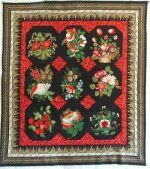 December 2012 Quilted Placemats. 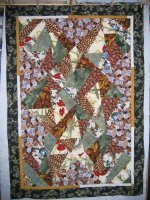 December 2012 A mini-quilt for a special friend. February 2013 Podcats. 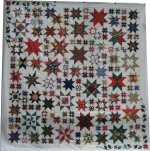 This is a block of a larger quilt pattern. 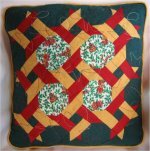 I opted to make ONLY this block as a throw pillow. April 2013 Just Ducky! 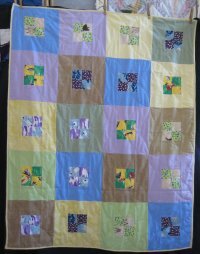 An almost instant baby quilt for a new member of the family. May 2013 Pinwheels. 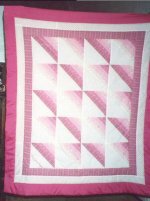 A new-to-me technique for making half-square triangles for a pinwheel block produced this quilt. July 2013 Skinny Strips. 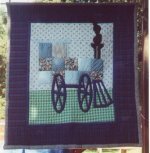 A "manly" quilt for a young male cousin. July 2013 for Jolene. 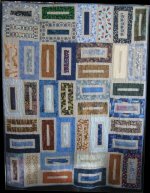 The previous Skinny Strips quilt was for Jolene's brother. She gets equal time! 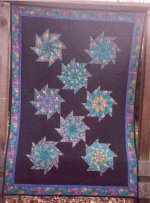 July 2013 My first hexagon Forever Project. 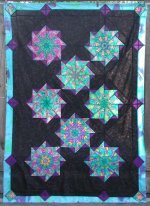 It started on a whim, just to see if I would like working with hexies. 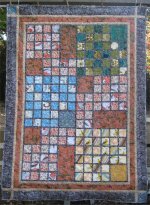 I finally finished the top in March 2015. August 2013 Oink-a-Doodle-Moo! 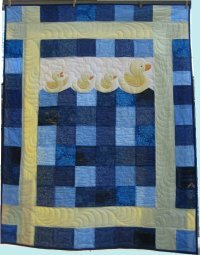 Using a panel print as the foundation, a baby quilt was made for the next newest member of the family. 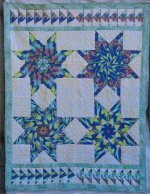 August 2013 A commissioned quilting. 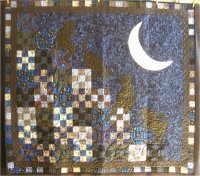 I did the quilting only on this quilt. A pantograph confined to the interior center medallion is a bit tricky to do! January 2014 Disappearing 9-Patch. 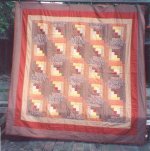 This is one of the 4 flannel quilts I felt I needed to make, for no good reason at all. 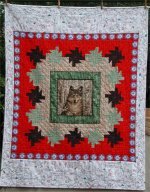 It turned out to be an ideal candidate for a fund-raiser quilt. January 2014 Framed 4-patches. 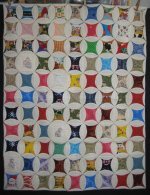 This is the second of the January flannel quilts. It also became a candidate for a fund-raiser. January 2014 Picture Frames. 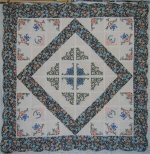 This quilt is a combination of flannel and quilting cotton and was third of the January flannel quilts. January 2014 Strips and Squares. 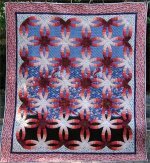 This is the fourth and last of the January flannel quilts. 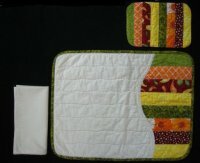 From pieced top to quilted and bound quilt, only four months! Amazing! July 2014 A zippered hexie bag. 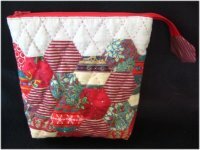 Hand-pieced using the English Paper Piecing technique and hand-quilted, this small bag features a "wide open" opening. October 2014 Cat Stairway to Heaven. 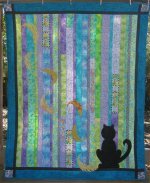 A memorial quilt for a dearly beloved cat, who was a companion for a friend of mine. 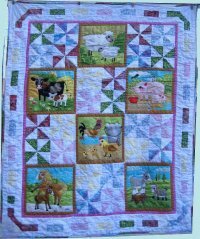 January 2015 A quilt for Mia. 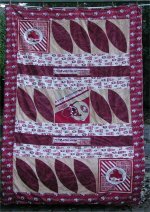 A serendipitous 49er quilt for baby Mia. January 2015 From Paris with Love placemats. My own baby girl was moving far away. Placemats to make the new apartment more like "home". 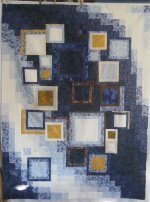 February 2015 Illusion quilt. One of my cousins adopted brothers. 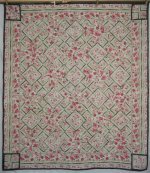 This is a quilt for one of them. February 2015 Jar I-Spy. 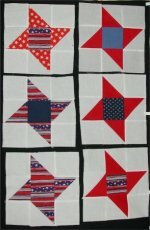 and this is the quilt for the other brother. February 2015 Spiral Columns. A Rodgers niece had a baby boy. 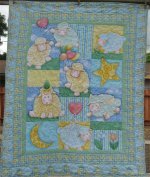 Time for a baby quilt! April 2015 Chickadee in the Spicebush. 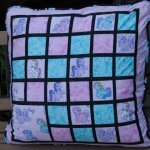 Made from Cuddle fabric, this personal size quilt is UNBELIEVEABLY soft. May 2015 Science Fair hexagons. 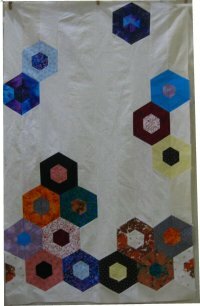 A nifty layout for hexagons, in a modern looking quilt. 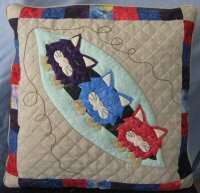 June 2015 Pillow from hexagons. 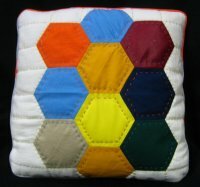 I used up some leftover hexagons to make a throw pillow. June 2015 Space: Above and Beyond. 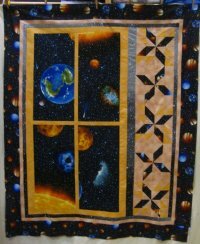 An outer space fabric called for me to make this panel quilt. July 2015 Ang's Placemats. A crafty friend had her kitchen wonderfully remodeled. This is a "welcome new kitchen" present from the rest of us. July 2015 It's Raining Hexies. 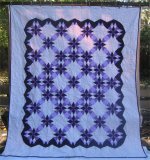 An unusual use for printed hexagon fabric prompted me to make this quilt. 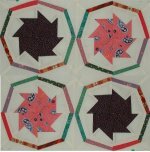 July 2015 Hexagon placemats and table runner. More leftover hexagons and an aged UFO become my latest finish. September 2015 Sheep in the Meadow. 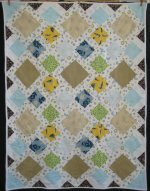 A baby quilt for the newest member of the extended Rodgers/Smith clan! 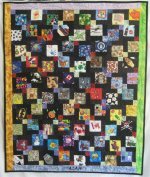 Donation quilts Donation quilts for 2015. 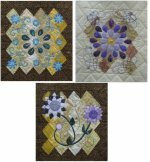 Experimenting with layout ideas or just a wild hair up my bonnet ... these turned out to be donation quilts. Tin Lizzie 18 In July 2006, I bought a Tin Lizzie 18, a longarm quilting machine. Mine is the original model and came "bare bones". This section shows how I have set up certain things with Lizzie. I have verbage on how I put the leaders on my rails, my method of side tensioners and using the Sidewinder with Lizzie. I will expand the content as I get around to taking more pictures and documenting them. Fold Your Stash Efficiently! 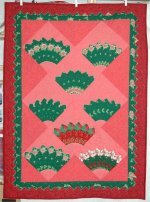 : I found (someplace) a really nifty way of folding my quilting stash. 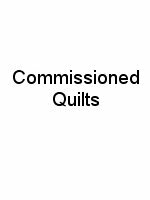 You will be rewarded with uniformly folded fabric and an easy way of estimating how much yardage has been folded. 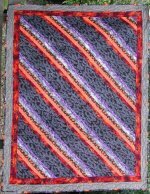 It is much easier to organize your fabric if it is all folded to the same dimensions. 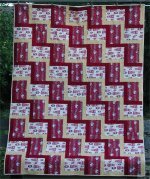 This method will also make it very easy for you to cut strips from the folded stash WITHOUT completely unfolding it! 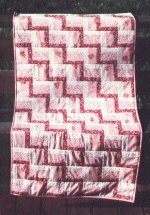 It took me several nights of watching many TV shows but I eventually got all of my quilting fabric re-folded in this manner. 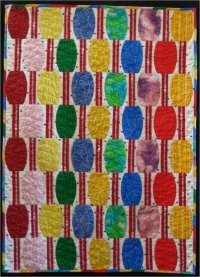 Continuous Bias Tape: Ever wonder why you should use bias tape for binding instead of straight-of-grain? Ever wonder how to make yards and yards and yards of continuous bias tape easily? Click here for an explanation, yardage requirements and construction technique. 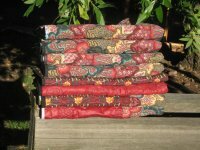 Joining double fold binding - the simple version! Here is a foolproof method on how to join the ends of double fold binding so that the seam is FLAT and the length of the finished binding is exactly what is needed for a perfect fit. 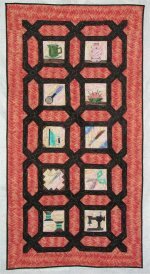 Envelope Quilt Label: Here's a clever quilt label that resembles an envelope. You open it up, unfold it to read the label ... and there's lots of room for writing! 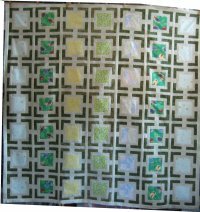 SWAK envelope block - the BETTER directions! 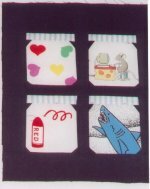 : Here are much better instructions on how to make the SWAK (Sealed With A Kiss) block. 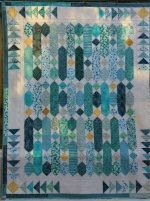 This is a revamping of the less-than-clear instructions given on the HGTV webpage that accompanied an episode of Simply Quilts. The Alternative Finishes Series. 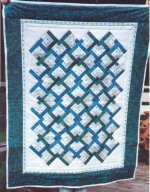 Tired of your quilts all having the same straight edge finish? 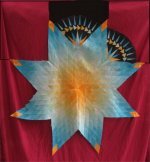 Want to have your consciousness raised so you know there are alternatives to a traditionally bound edge? 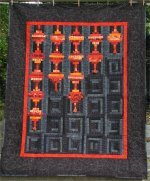 Want to put some pizzazz on the edge of your quilt? Then this is the series of handouts for you! The Alternative Finishes Series is a set of 4 pdf handouts that I use in the classes that I teach. Alternative Finishes 1: Bound Edges, Knife Edge. 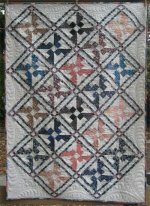 Shows simple techniques to jazz up a traditionally bound edge quilt and four different techniques of knife edge finishes. Alternative Finishes 2: Wrapped Edges, Scallops. 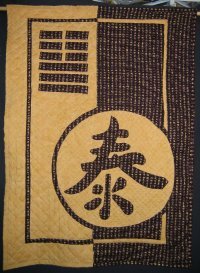 Shows two variations for a wrapped edge, where the backing fabric is brought forward to show on the front, and two techniques for finishing scallops. 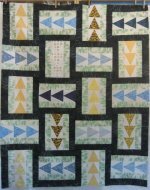 Alternative Finishes 3: Prairie Points (part 1): Individual, Strip pieced, Continuous pieced. 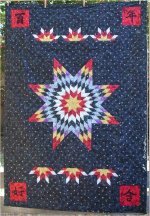 Shows the traditional way to make prairie points and then two alternative ways to create a whole string of prairie points in one or two colors. Alternative Finishes 4: Prairie Points (part 2): Piped, Reversible, Two-color. 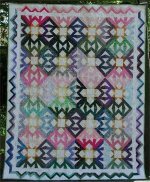 Shows to make accented prairie points, prairie points for two-sided quilts and bi-color prairie points. Knowledge of information presented in part 1 is nice but not strictly necessary. How to miter oddball corners. 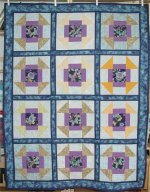 Now that you've mastered the 90� corner miter, what about those wierd corners, like 60� corners? Well, you are in luck. It's the same technique but with a very small variation. Look here for instructions and pictures. How to do a mitered corner for a napkin. 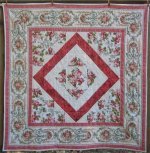 If you make your own napkins to coordinate with placemats or a tablecloth, you will want to miter the corners for a beautiful look. It's not difficult and you won't have that nasty lump at the corner, which you WILL get if you simply fold up the edges of the napkin. No webpage of instructions but a PDF version is available. 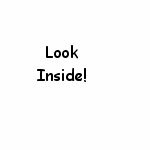 Left mouse-click to look at the PDF; right mouse-click for download. 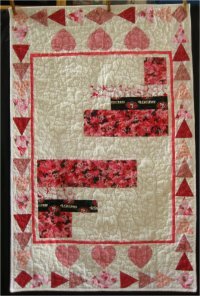 Freezer Paper Piecing Do you love the precision of paper piecing quilt blocks? Do you really, really hate tearing the paper away when the stitching is done? 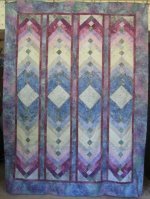 How about a technique that combines the best of both worlds .... precision piecing, no removal of the paper foundation afterwards AND you can re-use the paper template? Sounds too good to be true? In this case, it really is true .. come and learn this technique, popularized by the diva of Mariner Compass construction, Judy Mathieson, who uses this technique exclusively. English Paper Piecing preparation There are MANY ways to prep your hexies (or other shapes) for English Paper Piecing, most of which simply did NOT work out for me. 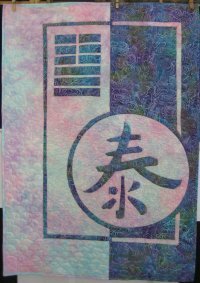 But when I discovered the thread basting method that leaves the basting thread *in* the hexie, my enthusiam was boundless. 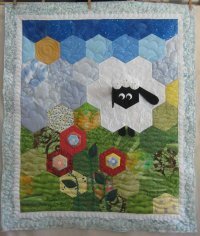 Here is a written tutorial on how I do prep my hexies. It contains a link so that you can print out the tutorial as a PDF and also contains links for a video where I show you in real time, how I do it. 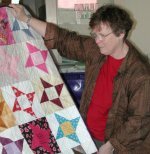 Over Memorial Day 2002, I hosted a "quilting retreat" of sorts for members of About.com's Quilting Forum. From an initial tentative guest list of 11 people, 7 ladies actually were able to make it out here. The most distant person came from Guam (yes! the island! ), the next distant was from Arizona; the rest were "local" from California. We had a marvelous time! We even got some quilting/sewing done! [grin] Pictures are here. You can email me at my email address.